Michael was born in Hornchurch, Essex. Following School he went to university in Rome where he studied Philosophy and Theology. He wrote a dissertation on political philosophy and became a socialist. This turned him towards the world of Social Work and Politics. Leaving Rome he taught for a year and then trained as a Probation Officer at the Home Office, where he met his wife Kath, a graduate of Edinburgh University. In 1970 they both gained posts as qualified Probation Officers in Staffordshire. Michael’s field of work became “the development of human personality” in Family, Group, Community and Societal settings. This approach took him forward in his work with Offenders in the localities of Stafford and Stoke on Trent and his 10 years at Drake Hall prison. The community perspective of human development led him right into the political forum. A human being is not just a product of the family but of the street, the school, the town/ city and the wider national community. Hence his commitment both professional and political to the citizens of Staffordshire and Stoke on Trent. 22 years of his working life have been spent working in the City. He was elected County Councillor for Stafford Westgate in 1981 and held periods of responsibility as Chairman of various committees and departments including Social Services, Highways and Fire Authority. Some of the crises he faced demanded real leadership, resilience and deep reserves of personal strength, leading through to successful conclusions. He has also demonstrated these capacities in his Chairmanship of the Police Authority. Michael has a unique connection with Drake Hall Prison. Early in the 1970s, the then Home Secretary Roy Jenkins decided to close several prisons including Drake Hall. With the support of the local community Michael protested this closure publicly even appearing on Television. However the closure went ahead. As Constituency Labour Party Secretary Michael began a correspondence with Roy Jenkins which in the end resulted in the Home Secretary changing his mind a year later and reopening Drake Hall as a Women’s Prison. Without that correspondence Drake Hall Prison would no longer exist. 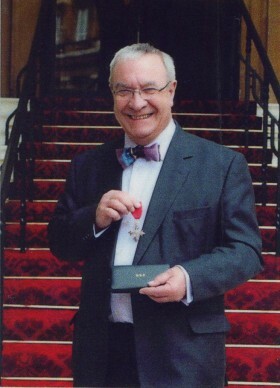 In 2009 as Chairman of the Police Authority Michael was awarded the MBE for services to the people of Staffordshire. Michael is married to Kath and they have and lived and worked in Staffordshire for 40 years. They have two adult sons Jeremy and Alex who were educated at King Edward VI comprehensive school in Stafford. Both are graduates, Jeremy is a practising Architect in Derbyshire and Alex is an Aerialist/Actor based in London. They have 3 grandchildren.